VIP Seating & Reserved Parking packages go on sale on April 15th! Worried about the lines? The heat? Making sure you get to see your graduate from a great spot? Bypass the lines and the stress, and purchase a VIP package! Click this link to view the auction and purchase packages directly! 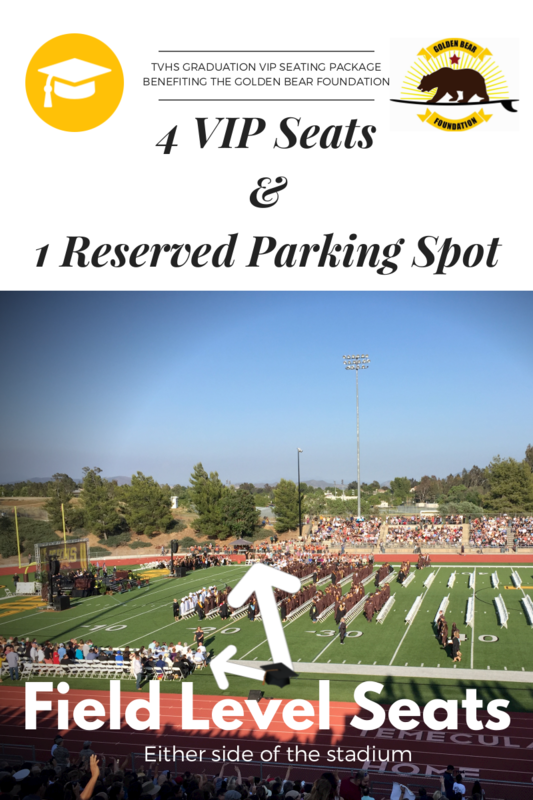 : VIP Seating Packages PLUS Reserved Parking! The Foundation was established in 2008 on behalf of, and in support of our current and future students. The Foundation is a California Public Benefit Corporation. IRS Section 501 (c)(3) Non Profit Organization. The Golden Bear Foundation is a charitable organization providing a permanent fundraising source for enhancing the development of our students, and encouraging them to excel in their education and specific areas of interest. The GBF Board of Directors are parents or legal guardians of current TVHS students, who volunteer their time and efforts in support of TVHS Programs. Our programs consist of TVHS parent support groups or “boosters” for athletes and non-athletic clubs as well as scholastic and social clubs. We support a variety of athletic, academic, performance, and social clubs associated with Temecula Valley High School. Use the links below to find out more about the clubs your student is involved in.